Helping as many people as possible with the chiropractic care they need! Since he began practicing in 1990, Dr. Andrew Rawlings has been steadfastly committed to helping his patients experience peak health and wellness. Using gentle and specific chiropractic adjustments, he has helped his many patients in Irvine live their best lives without drugs or surgery. Chiropractic also helped his wife with her migraines and one of his daughters who had scoliosis. Dr. Rawlings feels blessed to have his wife Tessa and other friendly staff members working at the practice. “We joke that sometimes people come to see them and not me. They set the office apart from the very beginning. So many offices can have a negative vibe at the front or they have a big window that they close and sit behind and only talk to you when they want to talk to you.” You’ll always feel at home at Irvine Health Center. Whether they’re in chronic pain and looking for relief or simply want to maintain wellness, the patients at Irvine Health Center can enjoy better health through chiropractic. Dr. Rawlings takes the time to educate them on the benefits of long-term chiropractic care and how it can help them enjoy life to the fullest with greater vitality. Many of his patients take a proactive versus reactive approach to health. They’ve experienced firsthand the many benefits of chiropractic care and want to live their healthiest lives with the help of chiropractic. 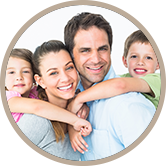 Are you looking for a wellness family practice? Contact our Irvine office today to book an appointment! Office front parking is available for your convenience.